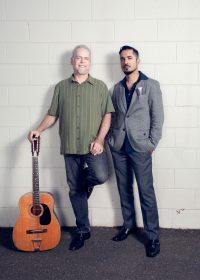 Aki Kumar (harp) and Jon Lawton (guitar) are a world-class blues duo who perform their unique brand of Delta, Chicago, and country blues with a deep passion and respect for this American art form. Jon Lawton has been playing guitar for over 45 years. Starting out on acoustic guitar in the ’70s meant folkie things like CSNY, Joni Mitchell and James Taylor. But then he began to chase the blues shuffle and never stopped. Little Jonny is an accomplished songwriter and guitarist and can fingerpick old-time blues, frail a little banjo, and slide some dobro. Jonny’s swingin’, resonant guitar work is the perfect compliment to Aki’s soulful harp playing, and together the musical chemistry of these two artists makes for a show not to be missed.